WELCOME to the fortieth issue of the Bay City Post! - Keeping you updated on the best city on the grid. This October marks the 40th edition of the Bay City Post. Who could have pictured that when Ever Dreamscape came to the Bay City Alliance and said "we need a newspaper," that it would still somehow be going today? Yet here we are, so many months later! We're now heading into the Autumn of the year. Blossoms fade, leaves fall, and you can begin to feel the crispness in the air as Old Man Winter's icy grasp slowly begins to take hold. Greens give way to golds and reds on the trees, and the nights grow ever so longer. This is the month of ghouls and ghosties, when the crypt doors creek and ghosts are present. When the grid quickly transforms from Summer delights to the dark horrors of Hallowe'en. We'll be seeing the Hay Maze again taking over the fairgrounds, while the year round creeps of the Hotel Falmouth and the Asylum await the easily spooked! “The Interview” Join Uccie Poultry-Seale as she interviews Cheree Shippe! 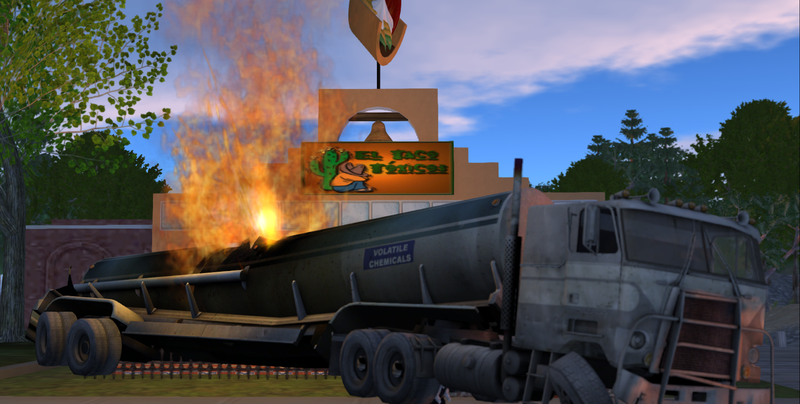 Explosive gas spill at Toxic Taco! ...but how is today different from any others? People are always getting explosive gas there? 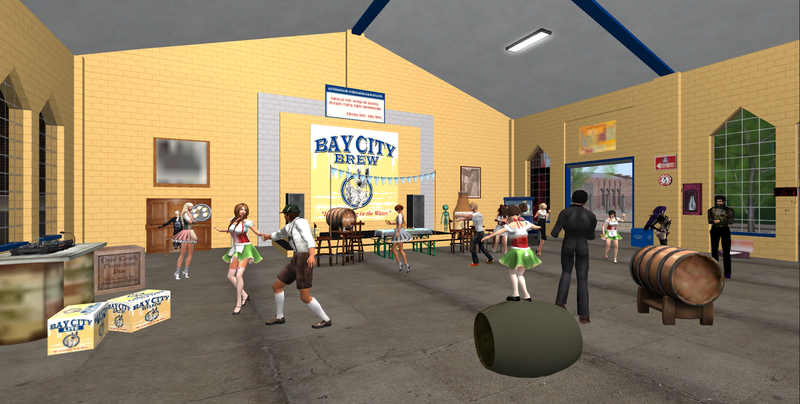 Bay City's third annual Oktoberfest was helps on Sunday, the 28th of September at the Bay City Brewery, to the appreciation of a large and thirsty crowd of avatars. DJ Cali Souther played a selection of tunes stretch from traditional Oktoberfest fare, polka tunes, German-language rock and pop, and just about anything patrons could request. Meanwhile, the spirits continued ot be poured. Truly, Bay City Brew lives up to its slogan, "There's Something In The Water." Pygar Bu was spotted swimming in the tanks for the event, which was assumed to only further season that special mix of gentle hops, sweet barley, and reclaimed gray water. Barrels were rolled, beers were served, and a good time was had by all. Oktoberfest was started in Bay City by Ever Dreamscape, and the event served a double purpose. An hour before Oktoberfest activities started, the dedication of the Ever Dreamscape memorial in Bay City - Dennis was held. After the dedication, the crowd marched down route 66, led by the wailing cries of blurtophones to the bay City Brewery. 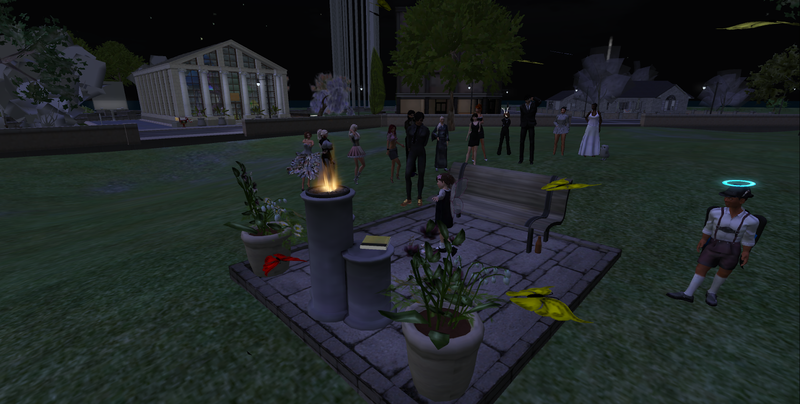 Today, we dedicate this virtual space in the memory of our departed Ever Dreamscape. Let it be known that Ever Dreamscape lit a fire in Bay City. I don't mean one of her scores of literal virtual fire this time, however. No, Ever Dreamscape quite literally helped transform this place. This place is a place to remember all she did and all she was. To list her accomplishments in Bay City is to list nearly everything that happened over the last several years. She turned events like Mole Day and the tree lighting and turned into much larger affairs, while being at the birth of other Bay City events such as our Oktoberfest this afternoon. She started the Bay City Post, our monthly newspaper. She helped get the fairgrounds expanded. She created the Bay City Brewery, She helped create The Pen, and she was in -- as I said -- everything. As you sit at this memorial, look beyond it. You can see the Park Plaza Hotel, Rez N Ride, the Hyperbole Building which serves as home to Etv and the Bay City Post, and -- on a good day -- her DMV/insurance/driving school. You can also see the buildings of others who were at least in part inspired to be her thanks to Ever Dreamscape. Our city itself serves as part of this memorial. Central to the memorial itself is an eternal flame. It's one of Ever's, sourced from the driving school. It is one of those that helped the city burn in her honor when she perished. As long as there is a Bay City, there will be this fire to help consume our memory. To the left is a book of poetry, composed by Ever Dreamscape under an alternate account. This book led to the initial creation of The Pen as a place to host poetry and other events. She would regularly attend Espresso Yourself night and share. At the last she attended, she even dominated the stage, telling her own life story. That piece, "Hero's Journey," can be found on her old website at http://21stnervousbreakdown.blogspot.com/2014/03/heros-journey.html - if you have not read it, please do when you can. And spend some time reading the book here too, if you wish. To the right of the fire is a frame. In it, you can see a looped slide show of photos of Ever Dreamscape. Both ones that all of us took of her, as well as ones she took in her many SL feed "feed-spam" marathons are presented. To each of you here today, I wish to offer you a copy of these photos as well, in the form of a memory book. Keep Ever with you always, even if she's not here in her living avatar form now. In her last weeks with us, more than once, she told me how important butterflies were to her. As a result, thanks to the talents of Alisha Matova, a dream image that came to my mind in her passing is realized. When you stand near the memorial, an endless stream of flame colored butterflies is released, spiraling upwards to the heavens. This is Ever's spirit, free and wild, unconfined. The butterflies may even be more than they seem. If you can catch one, you can ride it. One last bit of silly fun to be had in Ever Dreamscape's name. Before I finish, I want to acknowledge those who made this memorial possible. I mentioned already Alisha Matova, who built the butterflies and the triple-column plinth. Pygar Bu put together the flowers. Robin Sojourner and I created the frame slide show from her and your photos, and I did the rest of the overall structure. The Linden Department of Public Works, most notably Michael Linden and Sylvan Mole, helped with the permanent placement of the memorial here in Bay City - Dennis. I also wish to thank each of you for being here, for being a part of this day. This memorial is in her memory, but it is also for each of us to use, to reflect on, and enjoy. Recently, at a meeting regarding police and fire role play in Bay City reached an impasse, with one side requesting the role play respect the Bay City "theme period" ("the American urban experience, between 1940 and 1965, perhaps best typified by Chicago circa 1950 and marked by a distinct deco influence. "), with another insisting that this was too much of a hurdle, as vendors had not made adequate vehicles and equipment for the time frame. I will admit: I am in the latter camp. I respect the difficulties, and I understand that the most well-known emergency vehicle builders out there may well not have built a 1950 Seagrave Fire Truck or Nash Ambassador police cruiser, let alone the sort of gear that might have made the cast of Dragnet proud. But I would say this. Keep after those builders you like, and try to convince them there is a market for such. If it doesn't exist, no one will buy it and they will potentially lose out. Also, look to other builders: Bay City's own celebrated car constructor, ADudeNamed Anthony has built both police and fire units that do fit the period. They may not have all the bells and whistles you are used to from a builder dedicated to adding cop or fire gear to a ride, but they're really great mesh vehicles. And really, this can apply to anyone. It can be easy to grab the same cookie-cutter modern look seen elsewhere in Second Life. Or you can go that extra step and seek out something within the theme era. It's part of what makes Bay City that much more special when we all do it together. In short, don't "cop out" and go the easy route. Every place in Second Life can have the same cookie cutter modern Crown Vics and other gear. Make this something special, elite, and different. To paraphrase JFK, do it not because it is easy, but because it is hard.